Schmidt Siding & Window Co. was founded in 1949 by Robert J. Schmidt. In 1981, the company was purchased by Gary Schmidt and Dale Brenke. Jim Hockert and Steve Beetch joined as part owners in 2003. Through our company’s continuous growth, Robert’s grit and unwavering commitment to providing top-quality products and services have remained constant core values. They are what made us what we are today: the largest home improvement company in Southern Minnesota. Schmidt Siding & Window Co. has a big catalog of home improvement products and services. In 1986, we became part of the largest and most respected seamless siding franchise in the nation, ABC Seamless. 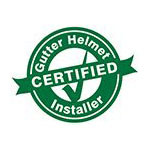 Five years later, we became an authorized dealer for Gutter Helmet®, the brand that has been the number one choice in gutter protection in America for over 30 years. Other industry-leading brands we carry today include Renewal by Andersen® and ProVia® replacement windows and doors, ArrowLine® and Gerard® steel shingles, Aristocrat™ awnings and shades, and Boulder Creek® stone products. We also sell and install steel soffit and fascia, seamless steel gutters, custom window and door wraps and other exterior home improvement solutions. But perhaps the best testament to our excellence in sales and service is non-stop business from repeat customers. In return, our promise is to keep our focus on the future while fulfilling the needs of our customers, employees, community and environment. We will continue to exceed your expectations and create customers for life. Call Schmidt Siding & Window Co. Call our office today at (800) 824-3772 or fill out our online contact form. Our sales representatives offer free, no-obligation estimates as well as free in-home consultations. We look forward to hearing from you!